Based on the preliminary entry lists, Chicagoland was set to mark the first time in 2017 where all three of NASCAR’s top divisions would have short fields. By Thursday, late additions came to the rescue for all three. The preliminary list for Sunday’s Cup playoff opener showed 39 cars for 40 spots, which was increased back to 40 by the addition of Rick Ware Racing’s #51 Chevrolet. Driving for Ware this week is XFINITY Series regular Ray Black, Jr., who after 31 Truck Series starts and 51 in XFINITY will make his Cup debut. Black finished 28th in last year’s XFINITY race at the 1.5-mile oval, but will not run double-duty with the SS-Green Light team on Saturday as Spencer Boyd will drive the #07. Both of BK Racing’s cars made the preliminary entry list, but the drivers weren’t updated until Tuesday. Corey LaJoie returns to the #23 for the first time since Darlington to make his first NASCAR start at Chicagoland. While his XFINITY ride for JGL Racing was withdrawn (see below), LaJoie’s Cup ride will carry sponsorship from Jewel Osco. Driving the #83 at BK is Brett Moffitt, who we haven’t seen in Cup since his 32nd-place finish last month at Michigan. Moffitt has one Cup start at Chicagoland in 2015, when he finished 31st for Front Row Motorsports. Moffitt takes the place of Gray Gaulding, who after a two-race stint with BK at Darlington and Richmond will return to Premium Motorsports for the first time since Bristol. Gaulding’s #55 Toyota will be sponsored by the U.S. First Responders Association, and he will also run for Premium in Friday’s Truck Series race (see below). Reed Sorenson remains in Premium’s #15 Low T Centers Chevrolet for Sunday, a track where his best series finish was a 7th in 2006. Sorenson drives in place of Derrike Cope, who parted ways with Premium after Richmond. Timmy Hill will drive for Motorsports Business Management at Kansas with U.S. Chrome as sponsor for the #66 Chevrolet. It will be Hill’s first Cup start at Chicagoland since 2015, when he ran 41st for Premium Motorsports, and his first with U.S. Chrome at the track since 2013, when he drove for Go FAS Racing. Congratulations to Michael McDowell and Leavine Family Racing, whose series of strong runs have been rewarded with not one, but two new sponsor announcements. Debuting on the car this week is Devour Frozen Meals (whose tagline is the cheeky “Food You Want To Fork”), followed by a multiple-race sponsorship from Procore starting next Sunday in New Hampshire. McDowell is still looking for a strong run at Chicagoland, where his best finish in six starts was a 32nd in 2014, and where last year a flat tire on his #95 drew a controversial late-race caution. With The Teenage Mutant Ninja Turtles as the title brand for Sunday’s race, there will also be a collection of special paint schemes with the stylized characters. Among them will be Matt DiBenedetto’s #32 Incredible Bank Ford and Jeffrey Earnhardt’s #33 Hulu Chevrolet. As of this writing, the XFINITY Series entry list stands at 40 cars, narrowly averting the first short field in 2017. Monday’s preliminary list promised to be even shorter following a season-high three preliminary withdrawals from a list of 40. On top of GMS Racing’s #96 for Ben Kennedy (the team’s third withdrawal of the season) and JD Motorsports’ “start-and-park” #15 for Garret Smithley (the team's sixth withdrawal, see below), Chicagoland saw the first withdrawal of the season for JGL Racing’s #24, which had up to this point run every race this season. Corey LaJoie, originally slated to drive for JGL this Saturday, will instead focus on Sunday’s Cup race for BK Racing. Bringing the entry list from 37 to 39 were the late additions Tuesday of owner-drivers Mike Harmon for Veterans Motorsports, Inc. in the #74 Dodge as well as Morgan Shepherd in his #89 Visone RV Motorhome Parts Chevrolet. Harmon’s best finish in 10 XFINITY starts at Chicagoland was a 22nd-place run in 2003. He will also run Friday’s Truck Series race (see below). Shepherd’s best in eight starts were a pair of 25th-place runs in 2010 and 2011. Getting the list to 40 cars took until just yesterday, when JD Motorsports re-entered the withdrawn #15 with Matt Mills driving. Garrett Smithley, originally slated to run the #15 before it withdrew, will instead drive a one-off in MBM's #40 Toyota alongside Timmy Hill in the #13. Driving in place of Smithley in the JD #0 is first-year K&N Pro Series East and ARCA driver Vinnie Miller, making his series debut. Smithley is expected to return to the #0 next week. Welcome back Chris Cockrum and Jeff Spraker’s #25 Advanced Communications Group Chevrolet, a driver and team we haven’t seen in the series since their 26th-place finish at Daytona in July. Cockrum’s speedway-exclusive schedule carries him into his first series start at Chicagoland. Also making his first Chicagoland start in the series is Canada’s Mario Gosselin, who is currently listed as the driver of his own #90 Chevrolet for his first start since Indianapolis. Following finishes of 28th, 29th, and 12th during last month’s three road courses, Josh Bilicki makes his first oval-track start in the series since Michigan in B.J. McLeod’s #78 Prevagen Chevrolet. McLeod himself, replaced by Ray Black, Jr. at Rick Ware Racing in Cup, will return to his own #8 Chevrolet, leaving Tommy Joe Martins without a ride following his 29th-place run at Richmond. Road America winner Jeremy Clements has been solid at Chicagoland in recent years, finishing inside the Top 20 in four of his last five starts, including a track-best 13th in 2014. 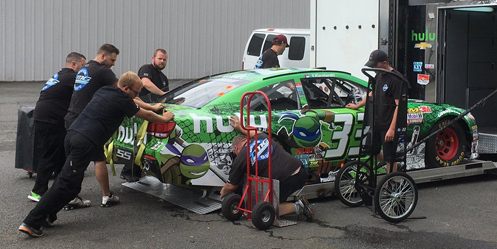 The Nickelodeon / Ninja Turtle group in XFINITY includes Matt Tifft (#19) and Darrell Wallace, Jr. (#98). Wallace’s “Green Slime” scheme will be on Biagi-DenBeste Racing’s Ford. Wallace’s best finish in three XFINITY starts at Chicagoland was a 3rd in the fall of 2015, when he trailed Joe Gibbs Racing teammates Kyle Busch and Matt Kenseth. Contesting Saturday’s win will be Cup Series regulars Austin Dillon (#2), Ty Dillon (#3), Daniel Suarez (#18), Erik Jones (#20), Ryan Blaney (#22), and Kyle Larson (#42). 30 trucks made Monday’s preliminary list for Friday’s first race of the weekend, but Tuesday’s addition of two trucks has now set a full field of 32. Joining the preliminary list are Ted Minor, who we last saw finish 27th at Iowa in June, back behind the wheel of his #14 Edge-Guard Chevrolet, and Mike Harmon’s #74, which returned to battle two weeks ago at Mosport, with Harmon himself making his first Truck start since Eldora. Weeks ago, Mike Affarano was originally slated to make his return to the series for the first time since 2015, but he has since decided not to enter his #03 Chevrolet. Friday will see Kevin Donahue’s first Truck Series start since he ran 28th at Iowa in June (driving the #63 Mittler Brothers Chevrolet alongside B.J. McLeod in the #36), Myatt Snider’s first start with KBM since his 16th-place run at Kentucky, and will also see Regan Smith and Ricky Benton’s #92 Ford make their first start since a 14th-place finish at Bristol. Justin Fontaine returns to the series for the first time since Pocono, this time driving Al Niece’s #45 Chevrolet. Five trucks are missing from Mosport. Tim Self’s #22 isn’t in the field, so driver Austin Wayne Self will return to Martins Motorsports’ #44 which was withdrawn in Canada. Bolen Motorsports’ #66 is missing for the third time in four races despite finishing 15th their last two times out. MDM Motorsports’ #99 is not entered for just the third time this year and the first since Pocono. The other missing trucks are Charlie Henderson’s #75 and Gaunt Brothers Racing’s #96. For the first time in their three years in the series, Premium Motorsports will enter two trucks in the same race. Joining Wendell Chavous, who makes his Chicagoland debut in Jay Robinson’s primary #49 is Cup rookie Gray Gaulding, who will pull double-duty for the same team in Cup and Trucks. On Friday, Gaulding will drive a #15 Chevrolet. It will be Gaulding’s first Truck Series start since October 31, 2015, when he finished 21st for Kyle Busch Motorsports at Martinsville. Chicagoland is also expected to be the last race missed by Stewart Friesen as his Halmar Friesen Racing team finishes its support transition from Tommy Baldwin Racing to GMS Racing. As he did at Pocono, Mike Senica will pull double-duty between ARCA and the Truck Series, driving for Wayne Hixson in the former and Norm Benning in the latter. At Mosport, Senica continued his bid to climb the LASTCAR rankings as clutch issues parked him after two laps, ranking him just ahead of Joe Nemechek and Tommy Regan. Both Nemechek and Regan are entered again for Friday in the same #87 and #0, respectively. The 2017 LASTCAR lead remains with Todd Peck, who isn’t entered, by virtue of a bottom-five tiebreaker with Nemechek and Regan. Finally, kudos to both NEMCO Motorsports and particularly Jennifer Jo Cobb Racing, which both secured wraps for the Nickelodeon / Teenage Mutant Ninja Turtles weekend. John Hunter Nemechek's #8 will run a green paint scheme while Jennifer Jo Cobb's #10 will be bright orange.